It’s Thursday, October 25, 2018, and it’s an unusual food day: National Greasy Foods Day. Sadly, I won’t get to partake, as it’s a fasting day for me. It also happens to be The Hallowing of the Nestorius. He was a painter, animator, calligrapher, muralist, ceramicist, lithographer and kite maker, as well as a set designer and storyboard artist. 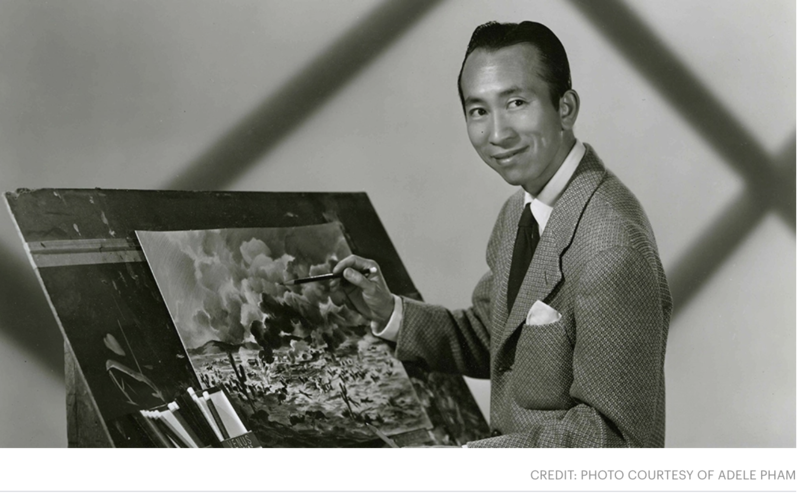 One of the most-influential and celebrated Asian-American artists of the 20th century, Wong was also a film production illustrator, who worked for Disney and Warner Brothers. He was a muralist for the Works Progress Administration (WPA), as well as a greeting card artist for Hallmark Cards. Most notably, he was the lead production illustrator on Disney’s 1942 film Bambi, taking inspiration from Song dynasty art. He also served in the art department of many films, either as a set designer or storyboard artist, such as Rebel Without a Cause (1955), Around the World in Eighty Days(1956), Rio Bravo (1959), The Music Man (1962), PT 109 (1963), The Great Race (1965), The Green Berets (1968), and The Wild Bunch (1969), among others. For Bambi alone he deserves great accolades, but the man was largely overlooked during his life. Posting will be light today as I have two interviews/Skype sessions, one with students at The Evergreen State College. That should be interesting! On this day in 1760, Mad King George (George III) became the ruler of Great Britain. On October 25, 1940, Benjamin O. Davis Sr. became the first African American general in the United States Army. On this day in 1962, Adlai Stevenson, U.S. 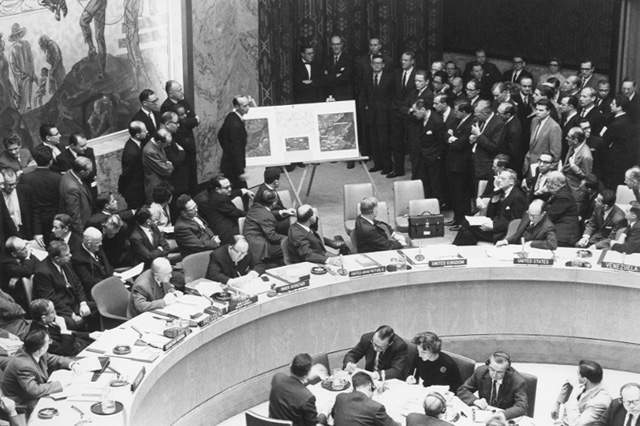 Ambassador to the United Nations, showed photos to the UN Security Council proving that Soviet missiles had been installed in Cuba. A picture of that display is below. I remember that my father, who was in the Army, told the family that he was on alert and might have to leave home. We were all scared that war was impending. On October 15, 1971, the UN accepted the People’s Republic of China as a member and expelled the Republic of China (Taiwan) as representative of the Chinese people. Finally, on this day in 1983, “Operation Urgent Fury” began, in which the U.S. and some Caribbean Allies invaded Grenada after the Prime Minister had been killed in a coup d’etat. The date of this invasion, today, is celebrated in Grenada as “Thanksgiving Day,” to commemorate the freeing of political prisoners, some of whom were democratically elected to office. Notables born on this day include Johan Strauss II (1825), Pablo Picasso (1881), Admiral Richard E. Byrd (1888), Bobby Thompson of home run fame (1923), Helen Reddy and Anne Tyler (both 1941) and Katy Perry (1984). Those who crossed the Rainbow Bridge on October 25 include Bat Masterson (1921), Virgil Fox (1980), Mary McCarthy (1989), Roger Miller (1992), Vincent Price (1993), and Richard Harris (2002). And don’t think that you’re immortal, either! Making these lists every day, in which the birth dates of those deceased approach my own, is not pleasant! 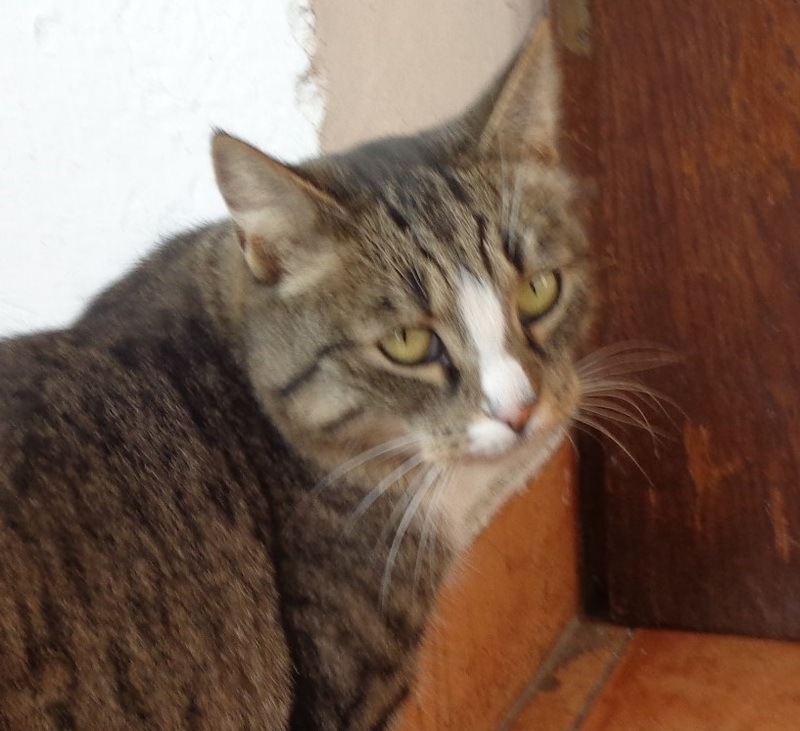 Hili: Is the humanity going shopping? Hili: Let it remember about my consumerism. Hili: Czy ludzkość idzie na zakupy? Hili: Nich pamięta o moim konsumeryzmie. #CrownPrinceInFII2018: #Saudi Crown Prince #MohammedbinSalman says #Lebanon's #Hariri will be in the Kingdom for the coming two days. It’s hard to believe that this is real, but it certainly seems real. These poor tortoises get a drink only a couple times a year! This entry was written by whyevolutionistrue and posted on October 25, 2018 at 6:30 am and filed under Hili Dialogue. Bookmark the permalink. Follow any comments here with the RSS feed for this post. Both comments and trackbacks are currently closed. Nay. Here in the UK the generic ‘greasy spoon’ caffs are a plentiful and popular provider of fry-ups and 24 hour Full Montys for the working man. How on earth did that art gallery thing work? It’s amazing enough as it is, but the fact that they get back into the picture at the end, and then the camera pans around it, and the two of them have somehow become two dimensional?? Without digital manipulation I genuinely can’t imagine how it’s possible. It’s the work of 28 year old, American, film maker Zach King AKA FinalCutKing ~ he’s the male animated painting & I’m pretty sure the Pearl Earring woman is his missus Rachel Holm. Zach started out after film school, making very, very short [six seconds] trick Vine videos [throw a playing card at an apple which splits in two etc.] & now he’s up to 30 second vids which is a whole days work. The digital manipulation is nearly all freeze frame work – the excessive camera shake is added in afterwards, but really he’s using cameras on tripods. The shake is the cheap, easy way to cover up mismatches where he’s done an imperfect cut. HERE is his YouTube collection – I like his short form six second stuff best. He is a very hard worker, for example the card throwing takes a lot of repetition to bet that perfect throw that hits the apple. Then moving on to posing his subjects identically before & after the cuts – exhausting & tedious. Amazing. I still don’t understand how he makes himself and his girl in a pearl earring look two dimensional though. He doesn’t. He climbs into her picture frame, they are about to kiss, but they notice there are visitors coming so they freeze their positions. Zach takes the frozen image & blows it up to the size of the picture frame on the wall. Prints it out. Puts it in the picture frame. Record while moving the camera to the left on a track [or he has a steadicam] to get a continually more angled of the picture frame with the frozen couple which now doesn’t contain the two 3D subjects, but a 2D picture of them. Edit the join of the 3D & 2D to be as seamless as possible. Introduce a lot of ‘wobble’ to the steady movie [using special software] to make it look amateur handheld – this hides changes in lighting & other errors at the join. The magic is gone. I can’t unread that. I’d already figured out roughly how he must have done it. If you look at the ‘picture in the frame’ as the camera tracks past it, you can see that it’s 2D. At the moment of transition to 3D, the perspective matches perfectly. But you know what? – I *still* find it ‘magic’ to look at. It’s a bit like finding out how a conjuring trick is done. The secret always turns out to be a bit mundane and (in 20/20 hindsight) not clever at all. This background info makes it even more fascinating, Michael. Adam West and William Shatner once did a pilot for a TV show on Alexander the Great. Can you imagine? There wouldn’t have been any scenery left after all that chewing! The pilot failed because anyone would take a font that uses the sigma as a stand-in for “E” as a marker of something created by idiots. Now I see where the inspiration for Zapp Brannigan’s uniform comes from. Dunno if Batman and the Riddler were libertines. But I do know my old man never failed to point out that Frank Gorshin was a proud second-generation Slovenian-American (as was my dad), whenever Gorshin would show face on our tv screen. Second-generation Slovenian-American celebrities were a bit thin on the ground, I suppose, so he claimed one whenever he could. … tortoises rush out …. I have two interviews/Skype sessions, one with students at The Evergreen State College. That should be interesting! On this day in 1760, Mad King George (George III) became the ruler of Great Britain. Your second Skype of the day is with Mad King George? Hey, neat trick! Who does your networking Bob Howard? I would point out that Maurice Bishop, the Grenadian “Prime Minister [who] had been killed in a coup d’etat” himself rose to power in a coup against the democratically elected government, seven years earlier. It therefore seems likely that the political prisoners who “were democratically elected to office” were imprisoned by Bishop, not by the leaders of the second coup.